The Gadsden Purchase, or Treaty, was an agreement between the United States and Mexico, finalized in 1854, in which the United States agreed to pay Mexico $10 million for a 29,670 square mile portion of Mexico that later became part of Arizona and New Mexico. Gadsden’s Purchase provided the land necessary for a southern transcontinental railroad and attempted to resolve conflicts that lingered after the Mexican-American War. In 1853, Mexican officials evicted Americans from their property in the disputed Mesilla Valley. 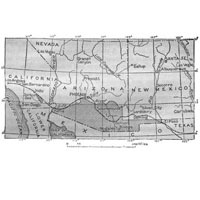 When the U.S. Government did not act, Governor William Lane of New Mexico declared the Mesilla Valley part of the U.S. territory of New Mexico. Mexican President Antonio de Santa Anna responded by sending troops into the valley. Attempting to defuse the situation, U.S. President Franklin Pierce sent James Gadsden, the new U.S. Minister to Mexico, to negotiate with Santa Anna. Secretary of State William Marcy instructed Gadsden to renegotiate a border that provided a route for a southern railroad, arrange for a release of U.S. financial obligations for Native American attacks, and settle the monetary claims between the countries related to the Garay project. Gadsden met with Santa Anna on September 25, 1853. President Pierce sent verbal instructions for Gadsden through Christopher Ward, an agent for U.S. investors in the Garay project, giving Gadsden negotiating options ranging from $50 million for lower California and a large portion of northern Mexico to $15 million for a smaller land deal that would still provide for a southern railroad. Ward also lied to Gadsden, stating the President wanted the claims of the Garay party addressed in any treaty concluded with the Mexican Government; however, President Pierce never gave Ward these instructions because he did not believe in government involvement in affairs between private companies and foreign governments. 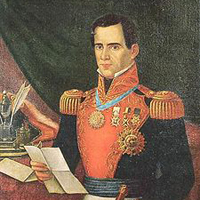 Santa Anna refused to sell a large portion of Mexico, but he needed money to fund an army to put down ongoing rebellions, so on December 30, 1853 he and Gadsden signed a treaty stipulating that the United States would pay $15 million for 45,000 square miles south of the New Mexico territory and assume private American claims, including those related to the Garay deal. The United States Government agreed to work toward preventing American raids along Mexico’s border and Mexico voided U.S. responsibility for Native American attacks.